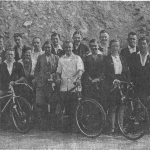 Weston Wheelers Cycling Club members back in 1936. 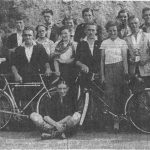 A couple of shots of the Wheelers and the French brothers, the photos come from the newspaper so are low quality. 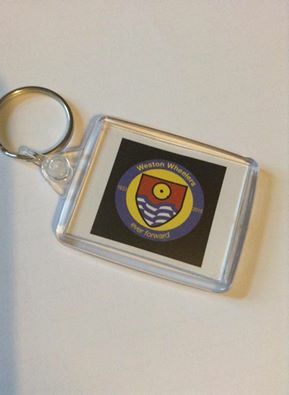 As ever, we'd love to see any photos of the Wheelers you might have, or any other information about the club through the years. 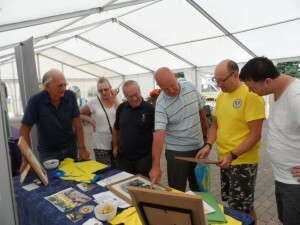 We had a good level of interest shown in the club today. Many thanks to the Wheeler members who popped onto the stand both old and new. Hopefully we have raised the profile of the club that little bit more. Those that visited and took details of the club away today you are most welcome to join us for a ride! We leave at 9 am Sunday from Priory School entrance. 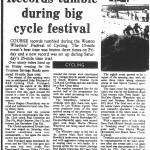 Course records tumbled during the Weston Wheelers’ Festival of Cycling. The 10-mile event’s best time was beaten three times on Friday and a new record was set up during Saturday’s 25-mile time trial. Over ninety riders lined up on Friday evening for the Trustee Savings Banks sponsored 10-mile time trial. 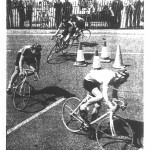 The winner of this opening event was, as anticipated, John Pritchard of RAF Cycling Club. 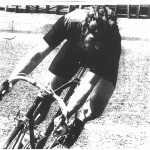 Pritchard, celebrating his award of the BEM listed in the Queen’s Birthday Honours that day, sped around the course in a time of 21m 16s, beating the existing record by over half a minute. Derek Rogers (Abertilly) was second and well-known local rider Danny Ellery third. Roger Harris took the juvenile prize with an exceptionally fine 23m 18s. Club coach Paul Goodrich did 23m 07s, Mick Osborne 23m 17s, and veteran Jim Earnshaw 23m 52s. The Chubb sponsored 25-mile time trial was staged on Saturday when weather conditions were very unseasonable - but again the course record was shattered. John Pritchard again dominated the event and his 53m 51s ride gave him an easy win over rivals Pete Danckwardt (Severn Valley CC) and Rod Collins (Bristol South). Derek Rogers was also in the placings with 55m 39s. (Missing Text) around the circuit were entertained by a vintage bicycle parade presented by South Western Veteran Cycle Club and Cyclebag and also by marching by a Red Cross band. The weather remained fine for the second half of the programme but with the wind increasing the racing became much harder. The schoolboys restarted proceedings with their main race, sponsored by Les Wilkins Cycles. This event produced some of the most spirited racing of the afternoon. Victory again went to Chris Taudevin (Cheltenham). Martin Burbridge (VC Equipe/Manulife) again took second place with Roger Harris (Weston Wheelers) just being eased into third position. The Wheelers came to the fore in the Juniors Main Race when Ian Bowditch broke away from the bunch and with aggressive riding succeeded in staying clear to win easily. In a furious sprint for the minor placings Paul Hazel (Clevedon RC) beat John Keat (Bath CC). 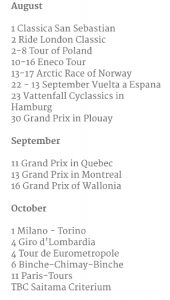 The eighth event proved to be a repeat of the opening race, with the same three riders taking identical places in tis Sports Council Sponsored event. 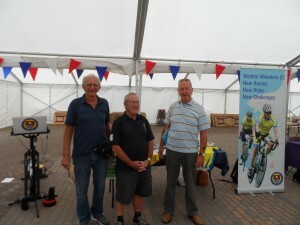 The main event for the third category riders was won by Somerset Road Club veteran rider Peter Sandy. Ian McCabe (Exeter Wheelers) was second and Graham Moore (Bristol RC) third. The final race of the day for senior riders produced a thrilling and colourful spectacle. The competitiveness of the riders made it extremely fast as they battled for the “prime” lap prizes. With a superb piece of solo riding Dave Park (Bristol South) succeeded in “breaking away” to finally win quite easily from Martin Wright (Becontree) and Shaun Baker (Team Zoyland). Trophies and prizes were presented by representatives of the main sponsors after the events and a cut glass rose bowl was also presented to Dave Park by Cllr. Tait on behalf of Woodspring District Council. 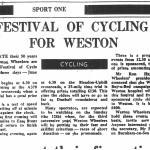 To celebrate their 50 years in cycling, Weston Wheelers are promoting a Festival of Cycle Racing over three days - June 10 - 12. The festival begins at 6.30 on the Friday evening at the A370 Bleadon-Uphill crossroads when a 10-mile time trial has a total prize value of £75. A time trial is a test of speed where riders, setting off at minute intervals, race against the clock. Riders on that first evening will travel the five miles to East Brent roundabout and return to finish opposite the start. On the following evening, again at 6.30 on the Bleadon-Uphill crossroads, a 25-mile time trial is offering prizes totalling £130. This time the riders will have to go as far as Dunhill roundabout and back. Many spectators are expected to be watching on the Sunday (the 12th) when, for the third successive year, Weston Wheelers will be putting on their fast and skillful criterium - races of short duration - on the promenade. 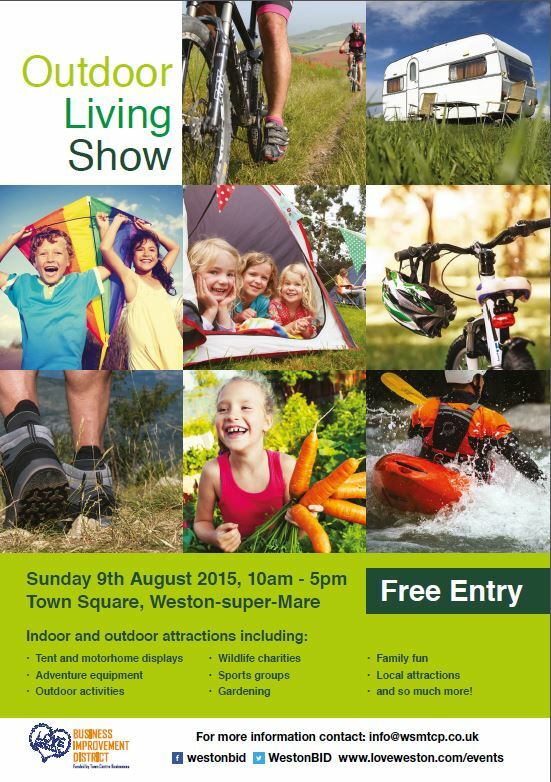 There is a programme of 10 events from 12.30 to 5 pm. Every one is sponsored, the total value of prizes amounting to £500. Mr Ron Hayes, Weston Wheelers’ President, has announced that the Weston Mercury Buy-a-Bed campaign for the new Weston hospital will benefit from this festival and from a non-stop sponsored cycle ride Land’s End to Weston. It is hoped to raise £400. 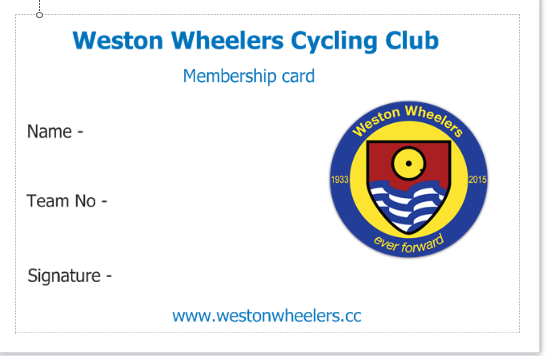 Weston Wheelers, planning to hold these events on a regular basis, invite new membership. Anyone interested should contact the secretary, Mr Paul Goodrich, on Burnham-on-Sea ******. 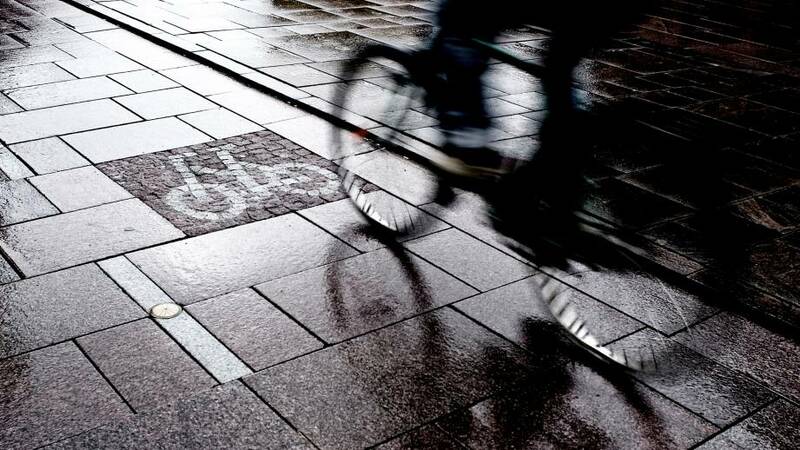 Today, the first ever legal requirement for the Government to produce a Cycling and Walking Investment Strategy comes into force. 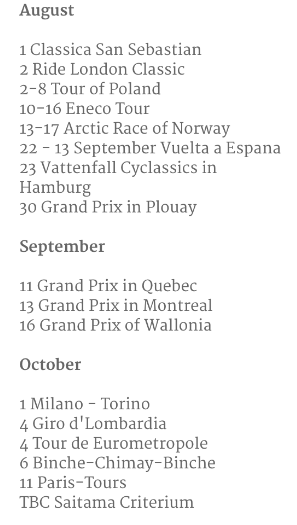 There's still loads to look forward to!